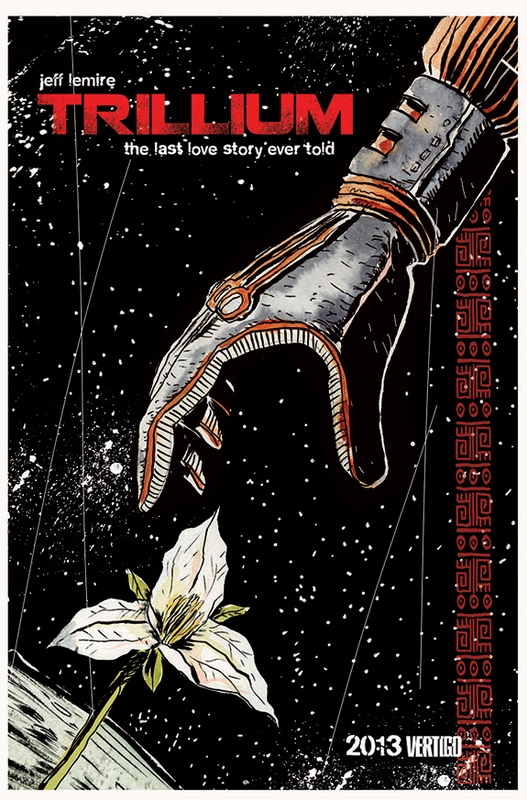 Today, at the Vertigo panel, it was announced that Jeff Lemire (Sweet Tooth, Animal Man) will write and draw a 10 issue limited series called Trillium: The Last Love Story Ever Told. This science fiction tale will deal with the end of the universe and how it’s inexorably linked to the dawn of human exploration. Oh and it’s also a love story. The series is set in two separate time periods, one will be 1,784 years in the future and the other 92 years in the past. The story will tell the tale of Nika, a botanist in 3797 who somehow falls in love with William, a war scarred explorer in 1921. This millennia spanning romance brings about the end of the universe. Lemire sited Arthur C Clarke, Mobeuis and even the current Brian K Vaughn series Saga as influences on Trillium.